Ready to start growing your email subscriber list? Have timely offers you’d like included on your site? Of course you do (you’re a smart marketer). Build your email list or highlight current offers. With the emfluence Marketing Platform, you can create light boxes and modals to quickly grab your website visitors’ attention. Build your email list or inform your website visitors of current offers, and determine how much time should elapse before you display the message. And in just a few easy steps, your website can begin collecting information from visitors that will help you deliver personalized messages and offers. Better input, better strategies. Isn’t that smart? Modals and Lightboxes That Don’t Box You In. Build a modal or lightbox that matches your website branding, add photos or forms, and create an experience that makes your visitors feel special. Plus, you can set delays and expiration dates for how often your visitors will see your modal. Want to make that mobile friendly? 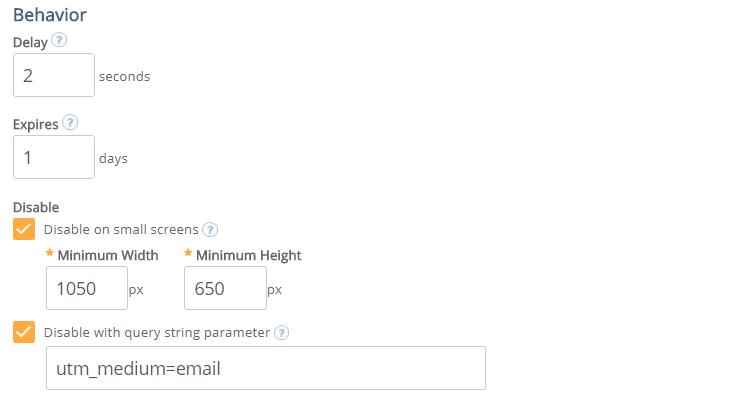 Just tell us what size of screen you want to hide your modal on, and we’ll take care of the rest.